Stroking a rabbit's soft fur and cuddling with your rabbit on your lap is an enjoyable way to unwind at the end of the day. Most rabbits are easily trained to defecate in litter boxes, making them ideal house pets. Keep your rabbit's cage clean and provide him with regular veterinary care, and the odds are minute that you'd contract a parasite from him that causes diarrhea. More than half of pet rabbits are exposed to the parasite Encephalitozoon cuniculi during their lifetime. The parasites set up shop in the rabbit's intestines before heading off to other parts of the body including the brain, liver, kidneys and other organs where they cause lesions called granulomas. Healthy rabbits may show no symptoms, but others may die of renal failure, liver failure or show neurological symptoms. The parasite is harmless to healthy humans, but severely immunocompromised people experience nausea, fatty diarrhea and weight loss lasting for months. Severe symptoms include damage to liver, kidney and the brain, similar to the rabbits. Drug treatment is available for humans but relapse frequently recurs once the course of medication ceases. Cryptosporidium causes diarrhea in both humans and rabbits and can be passed between the two species. Watery diarrhea accompanied by stomach cramping, dehydration and fatigue occur within a week after exposure. This parasite can also cause fever, vomiting and weight loss. Even the healthiest people may have diarrhea on and off for up to a month. Consult your physician if you have diarrhea that doesn't go away for several days or is accompanied by high fever. The most likely way to catch cryptosporidium from your rabbit is through contact with contaminated feces or water bowls. Treatment includes antiparasitic drugs, fluid replacement and medication to slow down your bowel movements. Toxoplasmosis is a major concern for pregnant women, but you can't catch it from your rabbit. Although rabbits have the disease and it causes diarrhea and other flulike symptoms in humans, it is only spread to humans through eating meat from an infected animal that is undercooked, cat litter boxes or infected soil. Cuddling with your bunny won't spread the disease nor will you get it from his feces. Another parasite known as coccidiosis causes watery or mucous diarrhea in humans and rabbits alike, but each has its own strain of the parasite that cannot infect the other. If you or anyone else in the household is immunocompromised, have your rabbit checked by a vet for the presence of parasites that may be contagious to humans. 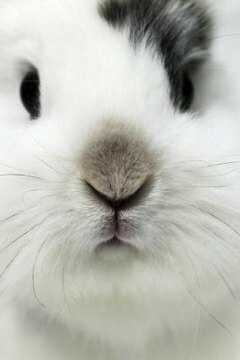 Medical treatment for your rabbit can prevent spreading the disease to immune-compromised humans. Clean your rabbit's cage and waterbowl frequently to and wear gloves to prevent contacting areas contaminated with feces. What Are the Dangers of Ferrets to Humans? What Kind of Germs Do Field Mice Have? Do Guinea Pigs Carry Diseases Harmful to Humans? Guinea Pig Feces Harmful to Humans?